Vintage arcade games and coin-op fortunetelling machines are among the collectibles on the auction block this weekend at Victorian Casino Antiques in Las Vegas. Online bidding is already underway for the October 12-13 sale. A number of the items like this very rare Sputnik Journey into Space-themed machine have strong graphic appeal. 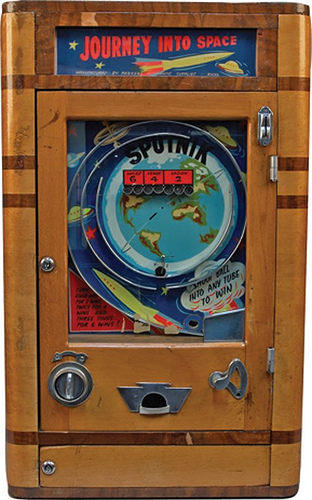 The arcade game was inspired by Sputnik 1, the first artificial Earth satellite. Launched by the Soviet Union in 1957, the Earth orbiting satellite began the Space Age and triggered the Space Race with the U.S. The countertop game (Lot #1151) was manufactured in the UK in the 1950s by Parker’s Automatic Supplies. It works with a large British penny and approximately 30 coins are included in the lot. The coin-op “Esmeralda” type fortune teller machine (Lot #688) is equipped with an Edison Cylinder Player and in working condition with keys. The manufacturer of this very old, rare machine is unknown. The starting bid is $10,000.